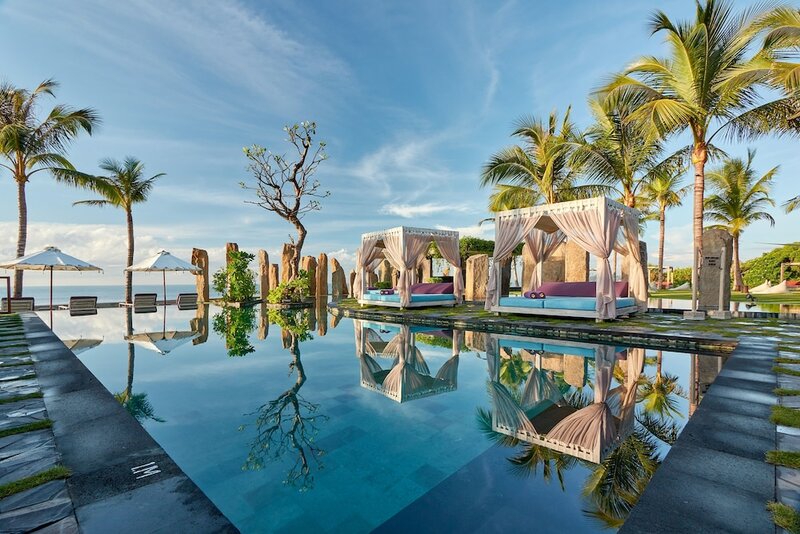 Standing Stones is the signature beachfront restaurant and lounge at The Royal Purnama Art Suites and Villas, which offers you a most exotic dining setting along the black sand coast of the secluded Purnama Beach in Gianyar on the east coast of Bali. The ocean views that accompany your dining experience are enhanced even further by a Stonehenge-like beachfront lawn installation of tall menhirs which give the restaurant its name. There are different sections to choose at Standing Stones, namely within the main dining area of the restaurant, or down at the violet cushioned daybeds on the lawn that flanks its curved, emerald-tiled pool. Of course, Instagram addicts will find the latter spots most preferable. From the lunch and dinner menu is an ever-changing selection of favourite Balinese dishes prepared in fine presentations, together with creative takes on popular Asian. Although the menu crafted by Balinese Executive Chef Made Sujaya is ever-evolving following seasonal produce and market availability, you can always have your scenic and laidback lunch overlooking Purnama Beach with a Standing Stones signature club sandwich (IDR 90,000 or USD 6.75): baguettes filled with chicken, bacon, fried egg, avocadoes and with Caesar salad and French fries on the sides, or a rendering of the Indonesian favourite nasi goreng fried rice (IDR 75,000 or USD 5.65). Stay on for the daily happy hours from 15:00-18:00 to enjoy a ‘buy one, get one free’ cocktail or Bintang deal. Refreshing cocktails to accompany your sundowners at Standing Stones include a well-spiced mix of fresh apple and lemon juice, with cinnamon infused in Martini Bianco for two weeks, as well as a strawberry balsamic crush, and an Ilmol Martini. There’s also a high tea offering that works great with the afternoon views, at IDR 150,000 (USD 11.25) for seven selections of cakes, or IDR 200,000 for 10 cake varieties, for two persons. To note, The Royal Purnama and Standing Stones doesn’t admit children. A minimum order of IDR 100,000 (USD 7.50) per person applies for public guests. The beachfront gazebos and swimming pool are chargeable at IDR 200,000 (USD 15) per day excluding food and beverage purchases.